Patter has given us a hymn that I am not familiar with this fortnight. Please visit her blog HERE to learn more about the hymn writer and read Patter's devotional thoughts. On my digital page I have shared part of the second verse as it stood out to me with this weekend being Good Friday and Resurrection Sunday. When I did a google search on this hymn ( cannot remember why I needed to as Patter had shared with us the piece of music sheet to use in our artwork and that has the words on it ) but I think the Lord wanted me to find that another version of this hymn has the verse I have shared slightly different. 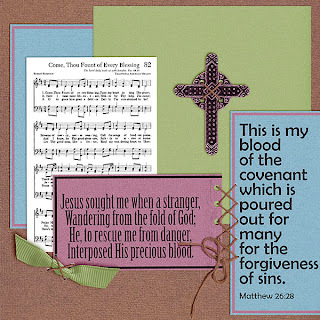 Instead of " Interposed His precious blood" it has "Bought me with His precious blood." This lead me to look up in the dictionary what the word "interpose" means and the meaning that stood out to me is "assume an intervening position". Our Lord, our precious Jesus, did just that as He hung on that cross - He assumed the intervening position of bearing yours and my sins upon Himself. He took the punishment I deserve. Thankyou Jesus for your precious blood that was shed for my forgiveness. Anne Marie, I love this and you consentrated on the same verse I did. I love your sewing also. Very nice work!